At the time of recording the songs of Guru, Rahman was black mailed by his master Mani Ratnam. A funny blackmail though. Being an ardent fan of Nusrath Fateh Ali Khan, Rahman dedicated the song “Tere Bina” to Nusrath Fateh Ali Khan. When Rahman began working on the soundtrack of Guru, he happened to listen to one of Nusrat saab’s softest songs called Sajna Tera Bina. He was really inspired by it and started composing Tere Bina. Originally, the song was about 25 minutes long. ARR often write six or seven mukhdas and then there are many variations. He also recorded the song Ay Hairathe for the film but Mani Ratnam felt it was too heavy to be at the start of the film. So Mani thought of using Tere Bina. 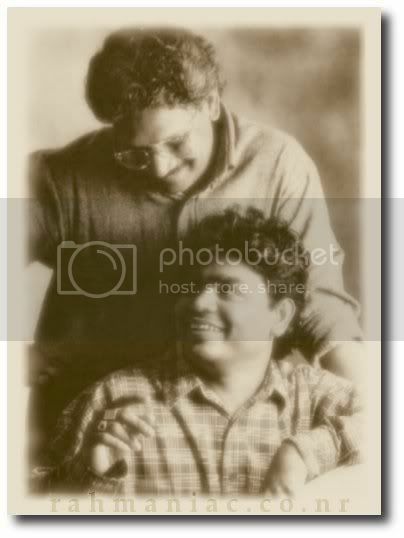 Asking whether it was a black mail from Mani Ratnam, Rahman replied “But in a good way (chuckles). I also told Mani sir that I was fasting then and didn’t have the energy to sing it. He said he would wait. The song as it is has some of Murtaza Khan and Qadir’s voices in the Dham Dara Dham Dara part at the beginning. Chinmayee joins Rahman later in the song. I was listening to the music of Amir Khusroo and his song Yeh Sharbati Ashiqui. I loved it. But most of the song was in Persian and that was going to cause us a problem. So Gulzar saab wrote the lyrics inspired by Amir Khusroo. I would say it is one of the best songs that have come out with my association with Gulzar. It was very important that he sang the song. It is the kind of song Mohammad Rafi would have sung four or five decades ago. It is a traditional kind of melody with lots of feelings but Hariharan makes it sound modern. He has done an astounding job. The song has a lot of masti in it. You feel it especially when Alka Yagnik joins in. It is a romantic and fun song. It is the most popular song in the album after Tere Bina. from where r u getting these kinda details man? its really interesting..i have downloaded these 2 songs…sounds great..keep giving news like this…hats off to u. Nice blog mahn!!! its incredible… its my homepage…. well can u get me the original 25 mins ka song????? well it would be like heaven lissenin to ARR’s compositions that tooo for 25 mins!!!! i listened the song of quadir. but me the AR Rahman’s version is the best. That doesn’t give the energy, interest so. Because I can’t speak hindi. I loved the song which was sung by AR Rahman, though i didn’t understand. Great job by AR Rahman. I can’t speak hindi. but I loved the tera bina song which was sung by AR Rahman, though i didn’t understand. that’s my favourite song, tera bina.